Thanks to the likes of Rosie Huntington-Whiteley and Millie Mackintosh, liquid detoxes, vitamin drips and juice cleanses are more popular than ever before. So it’s no surprise that the health trend has trickled down to the cocktail world. Bars across Britain are serving up drink concoctions that not only count towards your five a day, but are low in fat, cholesterol-free, have few calories and are rich in vitamins. While fresh-squeezed fruit juices have become common on serious cocktail menus, some of the best bartenders are turning to vegetables to incorporate seasonal and bitter components into their drinks. 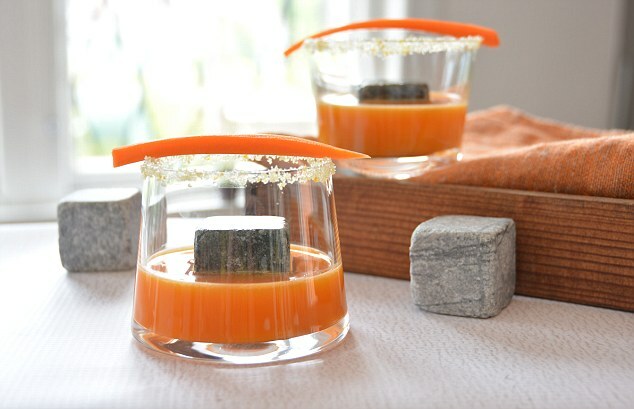 Shaken, stirred, fried, or simply puréed to a pulp, vegetables are cropping up in our cocktail glasses. Forget sad-looking sprigs that are little more than decoration — the new drinks put stalks, tubers, and other surprising ingredients at centre stage. UK Nightlife experts DesignMyNight.com have seen a spike in vegetable tipples on the country’s hottest cocktail lists. Speaking about the intriguing new rise, DesignMyNight.com co-founder Andrew Webster said: ‘The appeal of using veggies in cocktails is bright colours, bold flavours, bursts of refreshment without sickly sweetness and bragging rights among mixologists.